On the cusp of a new academic year, with ground enrollment at a record 16,000 students, including 8,500 living on campus, and with academic, residential and dining facilities going up in record time this summer, Grand Canyon University is on a tear. That was the message from President/CEO Brian Mueller to thousands of faculty and staff gathered Friday in GCU Arena for the annual all-employee meeting. 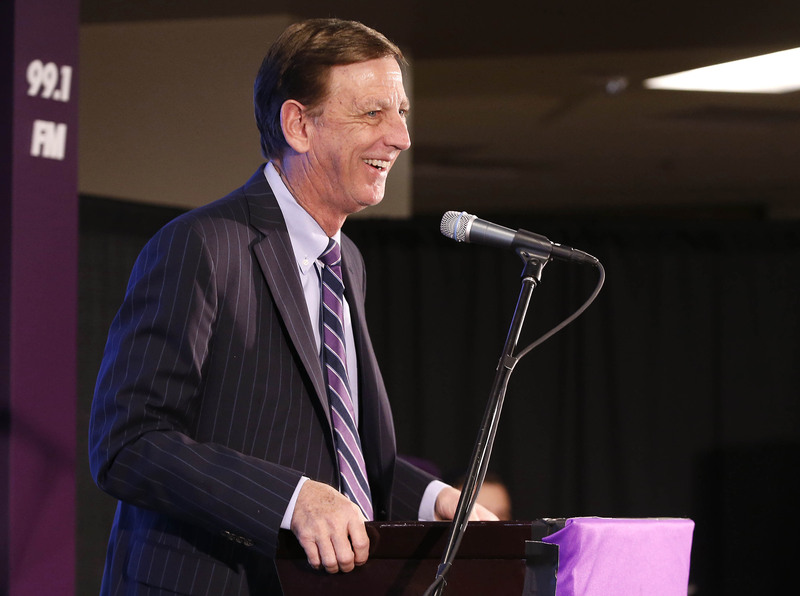 It was a “State of the University” address with this takeaway: Things are hot at GCU, toastier than the recent record-breaking temperatures across its Phoenix home. “Unbelievable changes” have taken place on the GCU landscape since school ended in April, Mueller said, including The Grove, four six-story residence halls that were built in eight months and 10 days; a STEM building for the new College of Science, Engineering and Technology (CSET) with a state-of-the-art music studio for students in the Center for Worship Arts; a soccer stadium that is expected to open in October with 3,000 berm seats and 3,000 more to be built in a covered grandstand; Lopes Way, an indoor/outdoor dining area with nearly a dozen new eateries, and the Grand Canyon University Hotel at the 27th Avenue office complex. But there’s more to come, he noted, from new intramural fields that could host employee teams (a suggestion met with crowd applause) and the GCU Golf Course at 59th Avenue and Indian School Road to a restaurant and conference center adjacent to GCU Hotel and a new student services building on the main campus. Further down the road, Mueller said, there will be 100,000 online students, 30,000 traditional students, a doubling of academic programs, a household-name athletics program, and more than 4,500 employees working in a thriving middle-class neighborhood around GCU. Mental health of students: Cody Dumas, president of Associated Students of GCU, said the student group plans to break the stigma of mental health issues with an awareness week in January and the launch of peer-to-peer counseling program. Faculty engagement: Provost Dr. Hank Radda said faculty are more enthusiastic than ever about their teaching responsibilities, advising student clubs, attending events and mentoring students. “They are completely jazzed about the quality of our students, the diversity of thinking, the energy here…” Radda said. STEM integration: GCU’s science, technology, engineering and math curriculum was built with workforce needs in mind, based on the University’s comprehensive collaborations with industry and educators, Radda said. Michael Sheller, CSET associate dean, called the programs “extremely hands-on, extremely real-world,” with most classroom time spent on building and analysis. Worship Arts: With their first extended play released in April, students are continuing to write and produce songs about the reconciliation, redemption and peace that come through Jesus, said John Fredericks, the center’s coordinator. Theatre and music: The University’s theatre program will perform Shakespeare, two comedies and a beloved children’s musical in Ethington Theatre this school year, said College of Fine Arts and Production Dean Claude Pensis. Students in the Music Department will perform for the first time Giuseppe Verdi’s “Requiem” at Phoenix Symphony Hall. Passion for the job: Several staff members revealed their commitment to GCU, notably Emily Montoya, an admissions manager for the West Valley who listed hers this way: passion for and relationship to God, then passion for the community, youth and education. Her team enrolled 540 students this fall, many of them the first in their families to attend college and with an average incoming GPA of 3.7. Public safety: Commander Kevin Robinson of the Phoenix Police Department noted that criminal activity has dropped — 16.2 percent in violent crimes and 16.9 percent in property crimes — in the quadrant surrounding GCU, partly because of the University’s public-safety initiative with the city. Heart for the community: GCU’s unique partnership with Habitat for Humanity Central Arizona to rebuild up to 700 homes in the University’s neighborhood has been impressive since its January launch. Habitat President and CEO Roger Schwierjohn said nearly 250 GCU student volunteers have contributed 1,900 hours to complete 56 repairs and assist 27 families. 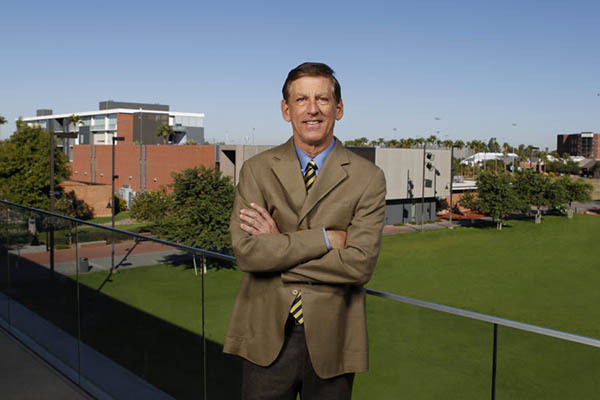 “They (residents) are seeing that GCU is not trying to run them out of their homes, and they are now proud to be part of this neighborhood,” Schwierjohn said. GCU employees can use the Donate to Elevate program to designate part of their state taxes to Habitat to help fund future projects. Randy Bellah, GCU’s director of academic alliances support, said in three years more than $1.3 million has been pledged by employees. The program costs nothing and does not impact an employee’s take-home pay. It merely reroutes through the payroll process state tax dollars to Habitat, or to GCU’s private and public school participants, if employees so choose. The Learning Lounge: GCU’s unique afterschool tutoring program for students at Alhambra High, down the street from the main campus, has helped raise the state test scores and grades of the students, many of them first-generation graduates. Dr. Joe Veres, director of K-12 Outreach Programs, credited the program’s success in part to the passion and dedication of the Lounge’s tutors, who are GCU students. Athletics: GCU’s name will be mentioned in the same sentences with Notre Dame, Texas, the University of Southern California and Alabama, said Mike Vaught, vice president of athletics. “You can thank the leadership of this University for that,” Vaught told the assembly.